Banno is a Japanese personal name written 伴野; another possible reading of the same characters is "Tomono". All the following company names are written in kanji characters in the original sources, and any of them might actually read "Tomono" instead of "Banno". It is not known if there is a relationship between the four companies listed below in chronological order of apparition. Banno Shōten (伴野商店) was a sales company which advertised Goerz cameras in 1922. Banno Bunzaburō Shōten (伴野文三郎商店) was a sales company in the early 1930s, which sold the Pathé Baby movie camera. Banno Bōeki K.K. (伴野貿易株式会社) was a Japanese trading company, with addresses in Tokyo (Ginza), Osaka, Dalian and Shenyang (the latter two in China). Its name is translated as "Banno Trading Co." in Sugiyama. The company was certainly the owner of the "Alma" brand; in the late 1930s and early 1940s, it distributed Alma still cameras, movie cameras and movie projectors. It also distributed various other cameras in the same period. Banno Toyoji Shōten (伴野豊治商店) was a camera shop in the early 1940s. Its name appears in the official price list dated November 1941 about the Semi Elka camera. The company perhaps also made or sold the Elka shutter, and the TB logo found on some of these might correspond to Toyoji Banno. 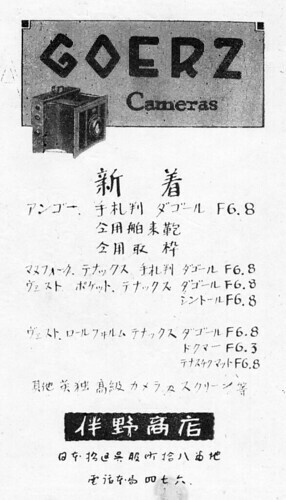 The company was advertising the Fuji Kōgaku Lyra cameras in February 1944. The address at the time was Nihonbashi-ku Dōri 2–2 in Tokyo (東京都日本橋区通二ノ二). ↑ Its address in Tokyo from 1939 to 1944 was Tōkyō-shi Kyōbashi-ku Ginza 6–4 (東京市京橋区銀座六ノ四). Source: advertisements reproduced in Kokusan kamera no rekishi, pp.58–9, 84 and 88, and column in Asahi Camera January 1939, p.190. ↑ Sugiyama, items 3002 and 4018. ↑ 3.0 3.1 Advertisements in Shashin Bunka October 1943 and Shashin Kagaku May 1944, reproduced in Kokusan kamera no rekishi, p.88. ↑ Advertisement reproduced in Kokusan kamera no rekishi, p.84. 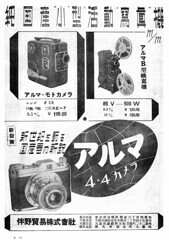 ↑ 5.0 5.1 Advertisement in Asahi Camera January 1939, p.A19. ↑ 6.0 6.1 Advertisements in Asahi Camera April 1940, p.A13, and May 1940, p.A13. 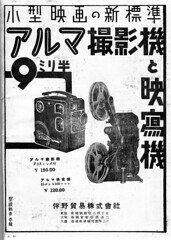 ↑ Advertisement in Asahi Camera December 1936, p.A59. 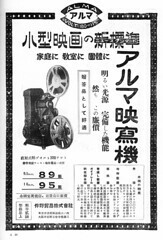 ↑ Alma 9.5mm movie projectors are briefly mentioned in the advertisement in Asahi Camera April 1941, before p.465. ↑ Advertisement on p.11 of Nihon Shashin Kōgyō Tsūshin, February 15, 1944, reproduced on p.75 of Hyaku-gō goto jūkai no kiroku. 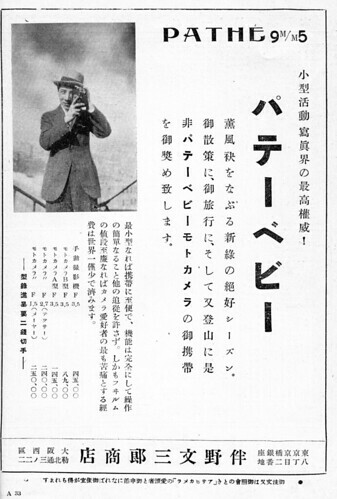 ↑ Advertisement in Asahi Camera April 1941, before p.465. ↑ "Kokusan shashinki no kōtei kakaku", type 3, sections 3A and 4A. ↑ Advertisement on the back cover of Nihon Shashin Kōgyō Tsūshin, February 15, 1944, reproduced on p.78 of Hyaku-gō goto jūkai no kiroku. Ars Camera. Advertisements by Banno Shōten in February and April 1922, no page number. Asahi Camera. Advertisement by Banno Bunzaburō Shōten in June 1932, p.A33. "Kamera no kōtei kakaku kanpō happyō" (カメラの公定価格官報発表, Official announcement of the set prices of the cameras), November 1941. Extract of a table listing Japanese camera production and setting the retail prices, reproduced in "Bebī Semi Fāsuto 'Kore ha bebī wo nanotta semi-ki da'" (ベビーセミファースト"これはベビーを名乗ったセミ機だ", Baby Semi First, 'this is a Semi camera called Baby'), an article by Furukawa Yasuo (古川保男) in Camera Collectors' News no. 277 (July 2000). Nishinomiya: Camera Collectors News-sha. P. 27. Type 3, sections 6A and 7A. Nihon Shashin Kōgyō Tsūshin (日本写真興業通信). Hyaku-gō goto jūkai no kiroku (百号ごと十回の記録, Ten records, every hundred issues). Tokyo: Nihon Shashin Kōgyō Tsūshin Sha (日本写真興業通信社), 1967. No ISBN number. Advertisement by Banno Bōeki on p.75, corresponding to p.11 of the February 15, 1944 issue, and advertisement by Banno Toyoji Shōten on p.78, corresponding to the back cover of the same issue. This page was last edited on 27 February 2019, at 11:30.